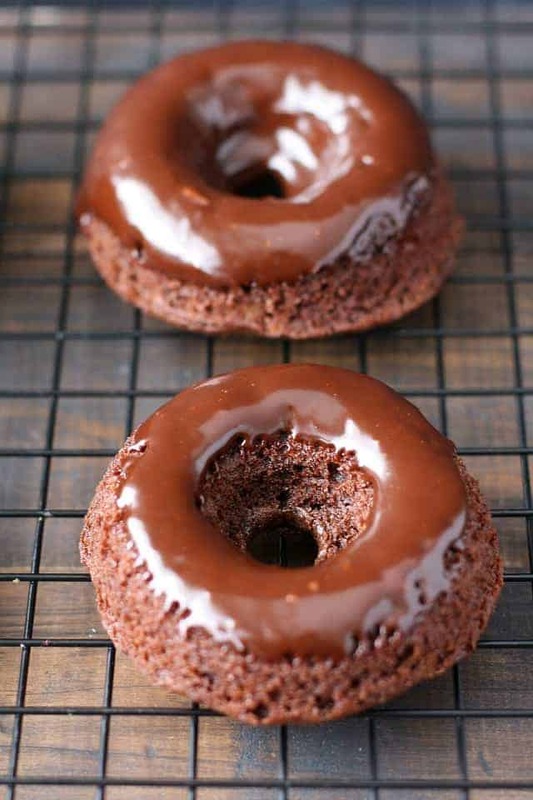 Home » Breakfast » Chocolate Gingerbread Donuts (Gluten Free, Vegan). Make your weekend morning special with a batch of chocolate gingerbread donuts! These treats are gluten free, vegan, and allergy friendly! When the weekend rolls around, my children usually ask for some kind of special breakfast. Sometimes it’s fluffy vegan pancakes, or cinnamon waffles, or chocolate chip banana muffins…we rotate through all of those options. And sometimes it’s a batch of donuts. And if I’m feeling really adventurous, it’s frosted donuts, like these chocolate gingerbread donuts. It’s so easy to make donuts at home, and that’s a good thing, because with peanut and tree nut allergies, donut shops are off-limits for us. But we don’t have to miss out! My boys love homemade donuts, and I love making them for them. If you don’t have a donut pan, you could make this recipe in a muffin tin instead. The baking time may be a little bit longer, so you’ll want to keep an eye on them. 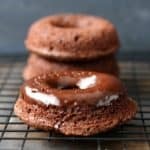 These chocolate gingerbread donuts are delicious with the chocolate glaze, but you could enjoy them plain as well. Or if you want to do something different, you could frost them with vanilla buttercream frosting. How do you prevent donuts from sticking to the pan? Most donut pans are non-stick, but if you are having trouble with donuts sticking when you try to remove them, you can go ahead and grease the pan with a little vegan buttery spread or oil. Baked donuts should last for 2-3 days when stored in an airtight container. 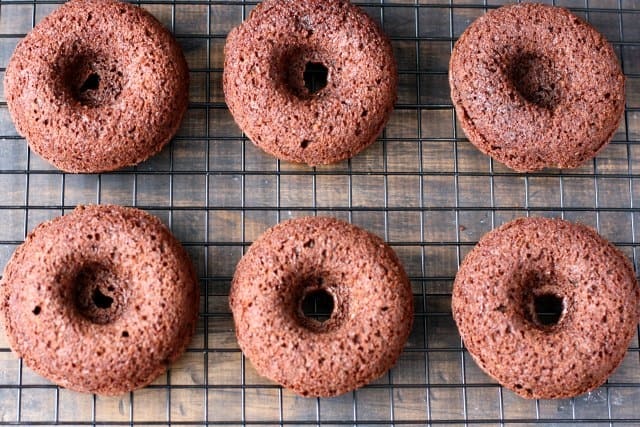 Can you freeze homemade chocolate gingerbread donuts? Yes, I think these would freeze well! Wrap then in waxed paper and then store in a freezer bag. They should last for up to 3 months in the freezer. 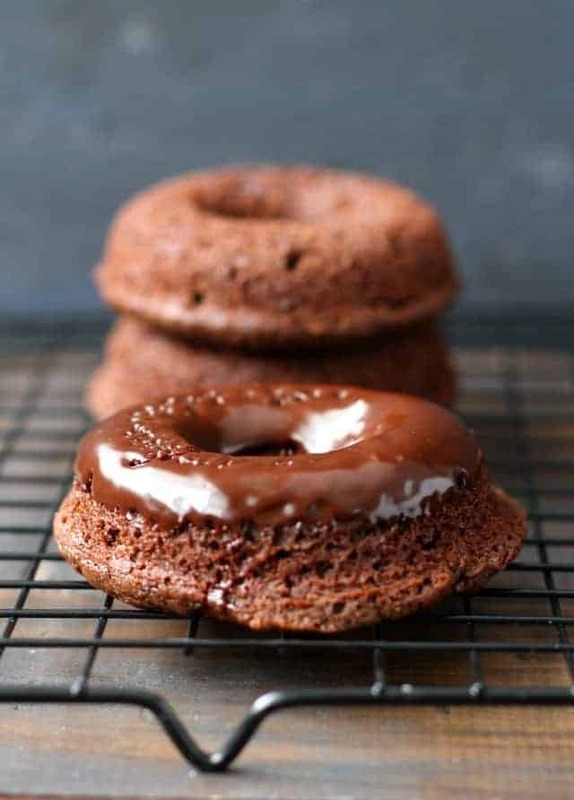 How do you make chocolate glaze for these donuts? 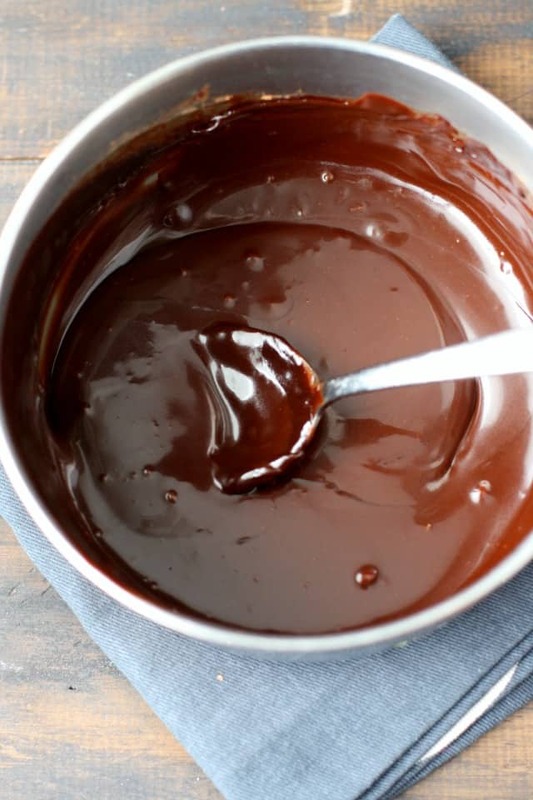 The glaze is simple – just vegan buttery spread, chocolate chips, brown sugar, cocoa powder, and non-dairy milk all melted together on the stove. If you make these donuts, or any of my other recipes, please share on Instagram and tag me @prettybeeblog. I love to see what you’re making! Chocolate Gingerbread Donuts (Vegan, Gluten Free). 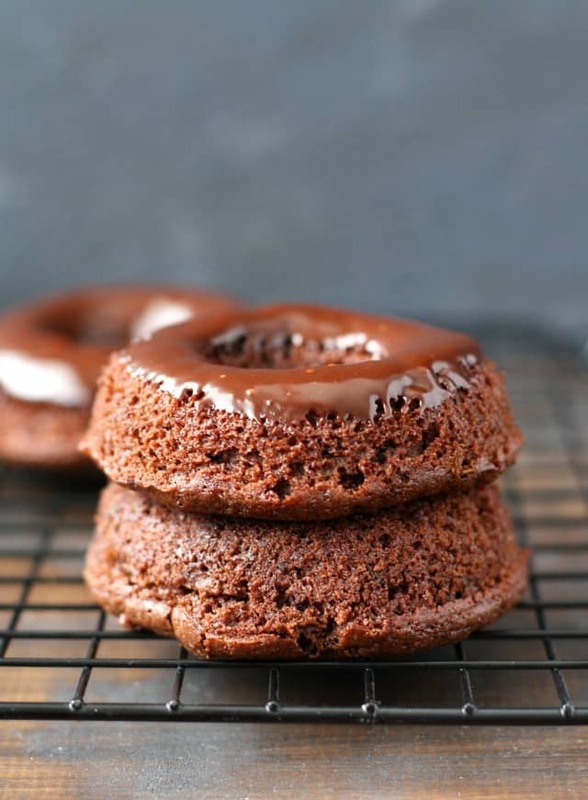 These baked chocolate gingerbread donuts are a perfect weekend treat! Preheat the oven to 350 degrees. Grease a donut pan. (Even if it is non-stick, I still recommend greasing it, just to make sure your donuts come out intact). In a medium sized bowl, whisk together the gluten free flour blend, sugar, spices, cocoa powder, baking soda, and salt. Add the melted vegan buttery spread, non-dairy milk, applesauce, vanilla extract, apple cider vinegar, and molasses. Stir well. Spoon the batter into the greased donut pan. Bake at 350 degrees for 12-14 minutes. Let cool in the pan for about 10 minutes, then invert the pan over a cookie sheet and tap the bottom to release the donuts. While the donuts finish cooling, make the chocolate glaze. Place the cocoa powder, brown sugar, salt, non-dairy milk, chocolate chips, and vegan buttery spread in a sauce pan, and cook over medium heat until melted. Stir often, and remove from the heat. Pour the glaze into a bowl and allow to cool for a few minutes. Dip the tops of the cooled donuts into the glaze. Enjoy! Store leftover donuts in an airtight container. They should stay fresh for 2-3 days. You can freeze these donuts - wrap in waxed paper, and then place them in a freezer bag. They should stay fresh in the freezer for up to 3 months. If you aren't gluten free, use all-purpose flour. « Blood Orange Poppy Seed Cake (Vegan). I just made these. The texture is AMAZING!! Theses donuts are delicious. You cannot tell the difference between these gluten free donuts and wheat donuts. I used Namaste gluten free flour for the first time today using your recipe. My daughter suffers from celiac disease and will LOVE these donuts. I am going to try your other chocolate donut recipe. Thank you for this amazing recipe and all the time you spend on your blog and recipes. Delicious recipe! A wonderful winter treat!